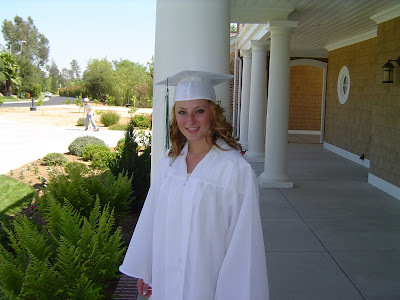 - Thinking about graduation (pic above is HS graduation, just to get me excited for the big one in July). It's sweet because it's so close, sour because it's so far. - This cloudy, cool weather. What's going on? It's like, 85 degrees in DC, but 65 degrees in San Diego? Sweet because I like cool weather and I'm glad east coasters get to enjoy some sun, sour because I'm so anxious for summer! - Falling asleep with contacts in. Sweet because I don't have to put contacts in when I wake up, sour because my eyes get really dry. - Planning the trip to Yellowstone for my whole family. Sweet because I love trip planning and I'm so excited for the trip, sour because it's just another thing on my plate. Speaking of sweet and sour, here's the recipe for the lemon bread I made a couple days ago. It's super yummy. The glaze makes it really sour, which is my favorite thing! When we go to the movies, I always want something sour and Conrad wants something chocolatey. Speaking of scrum-diddly food, I made a taco salad today that was out of this world. It's a sad moment when you realize that most of your best moments include food. In a mixing bowl, cream butter and sugar. Beat in eggs, lemon juice and peel. Combine flour, baking powder and salt; stir into creamed mixture alternately with milk. Pour into a greased 8-in. x 4-in. x 2-in. loaf pan. Bake at 350 degrees F for 45 minutes or until bread tests done. Combine glaze ingredients. Remove bread from pan; immediately drizzle with glaze. Cool on a wire rack. It has the texture and density of pound cake. That bread sounds amazing. I MUST try it! i was just thinking this morning about how much i miss yellowstone! i just put my phone backdrop back to a picture of it. you will love it! refer to my posts on what to hit or miss. most important thing is to have a charged camera and lots of memory sticks. because EVERYTHING looks like a post card. oh im so excited for u! I think you and your hubby should just meet us there. I'm serious. We think you guys are super cool.